The North West company behind a medical device that detects life-threatening infections is about to start its first clinical trial after securing a £1.4m investment. MicroBioSensor, a University of Manchester spin-out, was awarded the seven-figure equity finance in a funding round led by Maven Equity Finance, a Northern Powerhouse Investment Fund (NPIF) product fund managed by Maven Capital Partners, alongside investment from Catapult Ventures. From its base at the University of Manchester’s innovation centre UMIC, the firm has developed a device the size of an iPad Mini that could help those with kidney failure undergoing peritoneal dialysis. Dr Gordon Barker, CEO of MicroBioSensor, said: “2018 is going to be a very important year for our 11-strong team as we look to successfully run our first clinical trial which will last through to the second quarter of 2019. According to Dr Barker, of the 50 to 60 thousand Brits on renal replacement therapy, fewer than 10% are on peritoneal dialysis. One of the reasons that this beneficial treatment isn’t used is that people are worried about potentially life-threatening infection in the peritoneal cavity. Following the trial MicroBioSensor hopes to start selling its device for use in hospitals and clinics, potentially saving money for the NHS as well as improving patient outcomes. Ken Cooper, Managing Director at British Business Bank, said: “We are delighted that we have been able to make funds available to support MicroBioSensor though this pivotal stage in its development. These clinical trials are a major step towards bringing potentially life-saving medical devices to the UK market. MicroBioSensor has also received support through transitional funding and grants, including £983k from Innovate UK; £100k from investor Spark Impact; and £125k from UMIP, a division of the university’s intellectual property commercialisation agent UMI3 Ltd. The Northern Powerhouse Investment Fund provides microloans, debt and equity investments, ranging from £25,000 to £2m to help a range of small and medium sized businesses to start up, scale up or stay ahead. The Northern Powerhouse Investment Fund is delivered by The British Business Bank and is supported financially by the European Union using funding from the European Regional Development Fund (ERDF) as part of the European Structural and Investment Funds Growth Programme 2014-2020 and the European Investment Bank. 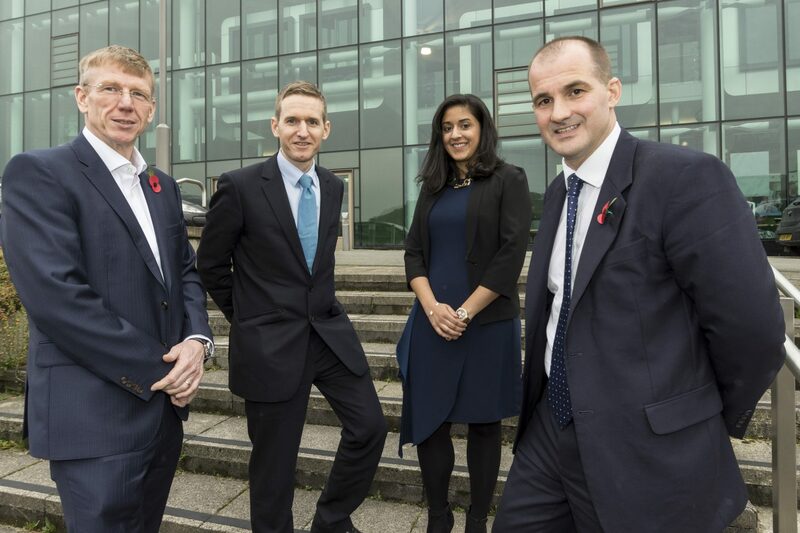 Photo Caption: Left to right – Ken Cooper, British Business Bank , Gavin Bell, Maven, Nishal Govindji-Bhatt, Microbiosensor and Jake Berry, Northern Powerhouse Minister.